PPT To Video Scout converts PowerPoint presentations into AVI or MPEG video with animations and sound. It supported video formats: MPEG, AVI, DivX, xDIV, VideoCD, FLV (flash video). This tutorial will guide you through PPT to AVI,MPEG video conversion process. PPT To Video Scout integrates itself into PowerPoint so you can convert PPT into AVI or MPG video by simply using File menu in PowerPoint. It supported NTSC, PAL and custom resolutions. Converts PowerPoint presentations (PPT) into video with animations and sound. 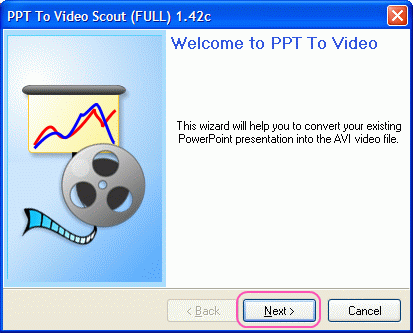 PPT To Video Scout converts PowerPoint presentations (PPT) into MPEG, AVI, VideoCD, WMV video with sound. This tutorial will guide you through PPT to AVI,MPEG video conversion process. PPT To Video Scout integrates itself into PowerPoint so you can convert PPT into AVI or MPG video by simply using File menu in PowerPoint. PPT To Video Scout supported conversion modes: Normal (as viewed by F5 in PowerPoint), Automatic Slide Show, Manual mode; It supported NTSC, PAL and custom resolutions and frame rates. PPT To Video Scout integrates itself into PowerPoint: you can use "Convert To AVI" command in File menu to launch conversion. For Software Developers: you can automate PPT to AVI, MPEG, FLV conversion via command line and re-distribute converter royalty-free! It contains functions of Video Joiner, Video Splitter, and Video Cutter. Convert PowerPoint to PSP MP4 video formats with the best quality. PPTonTV helps you convert PowerPoint to Video, burn to DVD disc. Qweas is providing links to PPT To Video Scout 2.46.27 as a courtesy, and makes no representations regarding PPT To Video Scout or any other applications or any information related thereto. Any questions, complaints or claims regarding this application PPT To Video Scout 2.46.27 must be directed to the appropriate software vendor. You may click the publisher link of PPT To Video Scout on the top of this page to get more details about the vendor.